Enjoy the Rock Bug videos below from Day 2 which includes all 4 courses plus the final shootout. Tip: If you have a fast connection and computer, hit the “HD” button in the video window when playing to watch the movie in full High Definition. It was an awesome first day here in the Sand’s Regency Hotel & Casino of Reno, NV. The weather, for the most part, was great and the crowd was awesome. Although building a man made course in the confines of a casino parking lot has its size limitations, the excitement of being in the “Biggest Little City in the World” made up for any small shortcomings. As expected, courses were very tight and extremely technical. Due to the extreme level of traction with the man made course, carnage was also on the high side. The hardest roll of the day definitely goes to Team Tsuda Racing of Japan. This team of 4 flew out from Japan and purchased Tracy’s Twisted Customs chassis from last year to compete in this event. On Team Tsuda’s last course of the day, they launched the rig clear off an obstacle and landed straight on their roof. The impact was so intense the entire chassis deformed on impact. Luckily, both drive and spotter are alright and have managed to get the vehicle running again for more action tomorrow. As for Tracy and The Rock Bug, the day went great. The Dana 300 is still acting up (that story seems to never end), but all in all they were both in great form and finished the day in 1st place. Troy Bailey finished the day right behind them so it is still anyone’s game in Day 2. If you were following along on Twitter, chances are you noticed a lag in my updates. Unfortunately, my iPhone died right as the event started, forcing me to update with only my laptop. I’m happy to say my iPhone is back in action and should be ready to go on Day 2. In the meantime, enjoy the course videos below of the Rock Bug from Day 1 and we’ll see you back here again for Day 2s wrap-up. Also, be sure to check out the final scores of both The Unlimited Class and The Pro-Mod Class from Day 1. Just a quick reminder on what’s coming up this weekend. The Rock Bug is heading out to Reno, NV for W.E.Rock’s Round 3 competition at the Sands Regency Casino. You read it correctly, for this event W.E.Rock is sectioning off a massive chunk of the Sands casino parking lot to hold, what may very well be, the best man made course of the year! If you can’t make it out in person, no need to worry as there are many places online to follow this weekends action. We wrote a detailed blog post awhile back titled “5 Must Visit Websites for Following W.E.Rock” so be sure to check that out if you are interested in following along. Also, don’t forget that Saturday, day 1 of Round 3, is set to be a night event so the Pro-Mod & Unlimited class will start at 4:00 pm. Sunday, day 2, will start in the morning at 9:00 am. 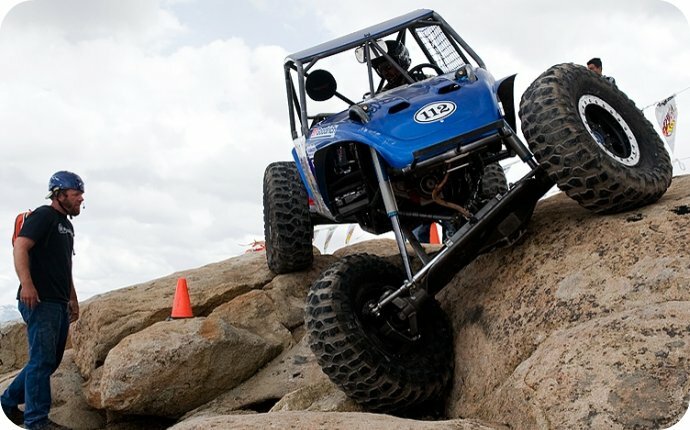 Spider 9 Axles are proving themselves, year after year, as a dominant player in competition motorsports such as W.E.Rock, XRRA, and King of the Hammers. Because I have the marketing skills equivalent to a burnt piece of toast, I have neglected to share the many stories that come in from competitors and their success using our products. Just the other day, we got a great e-Mail from Derek West and a light finally went off in my head. We have to make these stories public for all to read. For those new to the sport, here is a quick summary of Derek West’s achievements. In 2008, Derek took 1st place in W.E.Rock’s Pro Modified Series, W.E.Rock’s Grand Nationals, & XRRA’s Eastern Series. So far this year, Derek has already secured two XRRA 1st place finishes, a MOROC 1st place finish, and a W.E.Rock 2nd & 3rd place finish. In person, Derek is about as humble as one can be, but in competition motorsports he is without question a force to be reckoned with! Just wanted to drop you a note with an update on my teams performance. 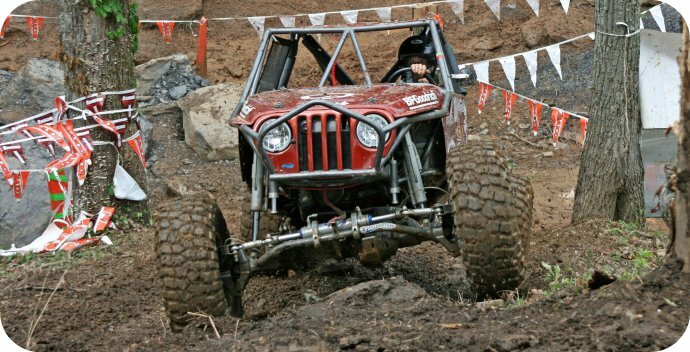 We were able to pull off a double win at the first XRRA double header at the Gray Rock off-road park in Alabama. With the competition getting tougher every event I rely on quality Spidertrax components to stand up to the abuse we dish out. Being able to turn 50 degrees in the tight, twisty courses was a huge advantage and a major factor in our back to back victories. I cant express enough how great it is to have complete confidence in my axle shafts after breaking 5 shafts and twisting splines on 3 more of another brand last year. I absolutely depend on my axle components to not fail so I can concentrate on my next course and not be rushed fixing something. I had all of my Spidertrax axle shafts out recently for inspection and there was absolutely not signs of twisting in the spline area, what a relief. Thank you for your great support and innovative products. Thanks Derek for the kind words and to all the other competitors out there running our products. We would love to hear from everyone using Spidertrax components, so please drop us an e-Mail and let us know your thoughts. If you want to learn more about Derek West and his team Crush Motorsports, head over to his website at http://www.crushmotorsports.com.